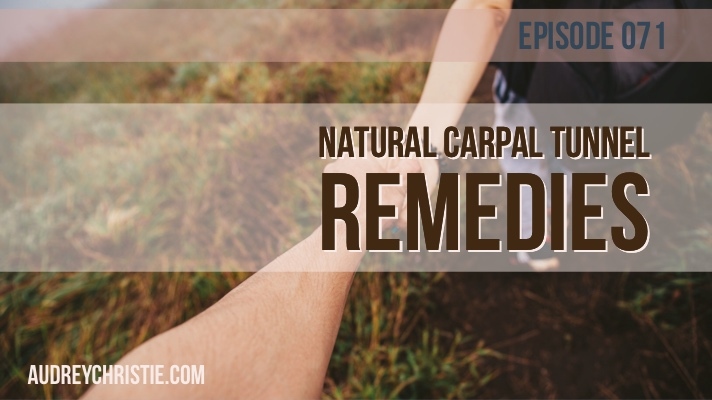 In this episode, you will learn about natural carpal tunnel remedies and why surgery doesn't cure the problem. Carpal tunnel is a pretty common neuropathy disorder of the hands. Some studies estimate that about 4% of the population suffers from this issue. It helps to know exactly what it is, in order to fully utilize and understand the benefits of various treatment options. As it sounds, the carpal tunnel is a literal tunnel in your wrist. The sides of the tunnel are made of ligaments and bones. In the middle of that tunnel is the median nerve, the tunnel surrounds that nerve providing it safe (usually) passage through the mobile wrist to the hand. Sometimes that tunnel gets inflamed, tissues get swollen and it aggravates the synovial membrane around the nerve itself, which in turn aggravates the nerve. The median nerve that passes through the carpal tunnel provides feeling to the palm side of the thumb and to the index, middle, and part of the ring fingers. The carpal tunnel is very narrow so it is pretty susceptible to swelling and inflammation caused by everyday stressors. Like many issues with our human suit, carpal tunnel has both a physical (or anatomical) and a physiological component to it. Carpal Tunnel is generally caused by overuse and stress in the tendon/ligament that builds up over time. It’s not an injury exactly where you “oops inflamed your carpal tunnel.” It happens gradually over time, due to extending the wrist too much and/or keeping it in one fixed position too often. Often this is a result of excess typing on computers/devices, working with the wrists extended, and poor posture of the arms/upper body. What are the symptoms of carpal tunnel? How do I know I have it? Usually, these symptoms start out less severe and sometimes not noticeable at all and then they build in severity and frequency. Often symptoms get worse at night. As you know, I like to give both options, the conventional treatment and then the holistic functional perspective, because more important than my opinion is informing you of the options so you at least understand the playing field. Medication. Your doctor will likely recommend over-the-counter pain-killer, such as nonsteroidal anti-inflammatory drugs (NSAIDs) like ibuprofen or Advil, when symptoms get bad. You may have already reached for these yourself without talking to your doctor. These do help reduce inflammation temporarily but are not a safe long term option. Sometimes your doctor will recommend getting steroid injections, usually, this is cortisone, also serving to temporarily reduce the inflammation. Eventually, symptoms will return if you don’t correct the root causes. Braces for carpal tunnel. This is a common way to stabilize the wrist during activity or sleep. It can be effective to prevent overuse and pressure. Again, it's not a long term solution but can help with symptoms. Surgery for carpal tunnel. This is the last resort option, even in allopathic medicine. It is a quick but risky surgery, back in my orthopedic first assistant days I assisted in 100s of these procedures each year. In the surgery, the ligament around the wrist is cut to reduce pressure on the median nerve with the idea that the ligament will grow back together with more space than it had before surgery. There are often side effects with this procedure. If it is effective, you can end up with a permanent decrease in hand strength, stiffness, and pain. Sounds a lot like the troubles you went in for doesn’t it? Many times, without treating the root cause, it is a temporary fix, and patients require repeat surgeries when the symptoms return. I don’t recommend these options if you are looking for a cure. These options certainly can relieve the symptoms, but as with everything in the body - it's more effective to heal the root cause. Simply eliminating symptom s is like putting a lid on a boiling pot. Eventually, the pot boils over. The same is true for these conventional carpal tunnel treatments, without any other adjustments, most have recurring carpal tunnel issues. Maybe even having multiple surgeries. Instead, when you take a functional approach and find the root cause, this using the same boiling pot analogy, it like turning off the heat. The boiling stops. The root cause for each person may be vastly different. But these factors will help you get healed at the root cause of your discomfort. Reduce stress factors that contribute to Carpal Tunnel. Carpal tunnel likely isn’t something you are just out there “trying to prevent” and I get that. In the same regard, if you are having carpal tunnel symptoms, it's probably not the only discomfort/trouble you are dealing with. When you first notice symptoms, rest and changing or modifying your activity to remove the repetitive and strenuous movement is a good idea. Movement and stretching to relieve carpal tunnel symptoms. Stretching and creating room in the carpal tunnel can be done in what I like to call wrist yoga. These are a few stretches you can do on your own anytime. Here’s a video I recently put together for the Wellness Circle on exactly what exercises you can perform. (There’s some additional information in there too! Jump right to the exercises at 6:11). See your chiropractor. If you are suffering from the symptoms of carpal tunnel syndrome, I recommend seeing your chiropractor for an adjustment. If you are part of my local peeps, I recommend seeing Dr. Jane Torrie here at Essential Healing Health and Wellness Center. Seeing a chiropractor has numerous benefits, and a chiropractor can assist with adjusting the wrists and realigning the carpal tunnel area itself to relieve pressure. Additionally, posture and spinal alignment has a direct effect on your wrist/hand movement so an overall adjustment can help you find the relief you need. Nutritional adjustment for carpal tunnel. Summing up the nutrition care is to essentially eat mostly plants and avoid inflammatory foods such as too much sugar, poor quality salt intake, alcohol, and processed grains. Instead reach for your whole fruits and veggies, and plenty of them. Make these the BASE for your diet. You need plenty of vitamins, electrolytes, and minerals to reduce your swelling and you get these goodies from plants. Drink plenty of water, it sounds counterintuitive but drinking water reduces fluid retention. Your body doesn’t hang on to it if it knows its getting enough. Supplements to help carpal tunnel. 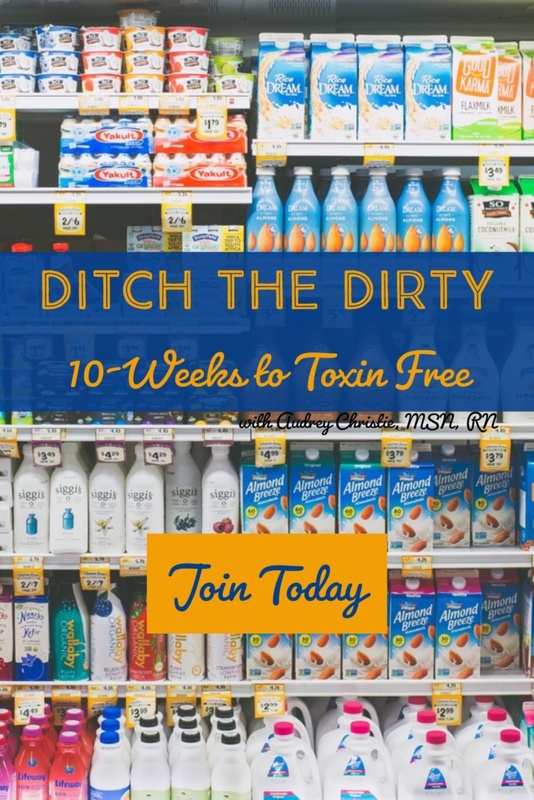 While overall you want to heal the trouble at the root, there are a few things that you can naturally to relieve symptoms right away and with benefits rather than detriments to your other body systems. Omega 3 fatty acid, this should be one you are taking already, but it is a major inflammation helper! I usually recommend adults take 3-5,000mg unless they have fat digestion issues. Next Vitamin B6 (usually 100mg 3x daily will do the trick). Vitamin B6 reduces inflammation in the body, and when combined with B12 the benefits are even broader. 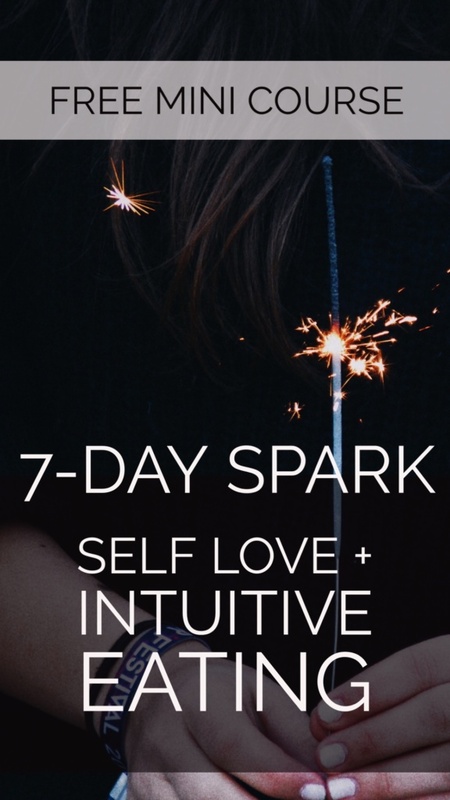 This combo can help to address both the inflammation and the healing of the nervous system. Next add Bromelain, an enzyme from pineapple. It has major anti-inflammatory effects on the all over the body, including achy joints. Magnesium Glycinate. This helps to relieve muscle tension that can pull on the tissue and compress the carpal tunnel. Magnesium is helpful for a whole host of other functions in the body as well. 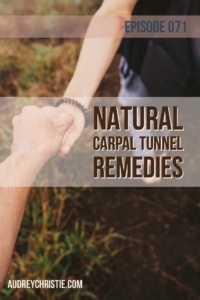 Essential oils and crystals to support the carpal tunnel. Wintergreen essential oil is very beneficial in relieving soreness and can help support the tissues in the wrist when applied topically. Young Living has a great Panaway oil that is a nice blend of Wintergreen, Helichrysum, and Peppermint that works wonders to support the body in this way. Add a bit of Frankincense to really boost the healing effects. My favorite crystal for this selenite. It’s an easy go-to and great for supporting all thing musculoskeletal. Reduce the stress factors, temporarily or long term. Finding new ways to do the same repetitive tasks. Add movement and stretching - I have the video on the show notes page. See your chiropractor. If you are local, head to see us at Essential Healing in Lake Dallas, we have a great chiro on our team here Dr. Torrie. Adjust your nutrition by avoiding inflammatory foods and increasing the plants in your life as well. Use EOs like wintergreen, helichrysum, peppermint, and frankincense to support the musculoskeletal system and help the body to activate its own healing.